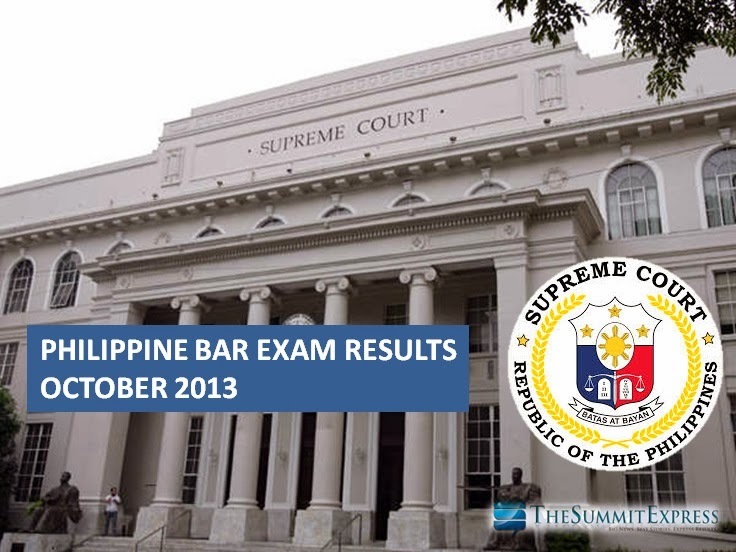 Manila - The official release date of October 2013 Philippine bar exam results is set on Tuesday, March 18, 2014 according to the Supreme Court Public Information Office (SC-PIO). SC-PIO reveals that Associate Justice and Bar Chairman Arturo Brion told the exact date of the release of the exam results during a public speaking engagement last week. In a report by The Manila Times on Sunday, it said that only about 20 percent of those who took the Bar examinations on four Sundays in October 2013 got the passing grade of 75, or better. It only means that the 2013 passing percentage is higher compared to 17.76 percent in 2012. The 2013 Philippine Bar exam consists of 20% multiple choice questions and 80% essay-type questions different to the 2012 exam which have 60 percent multiple choice questions and 40 percent essay type of problem. SC reported that of the 5,641 law graduates who applied for the Bar exams, only 5,593 actually took the tests, and only 5,293 were left by the end of the four exam days. Ignatius Ingles from Ateneo Law School topped the 2012 bar exam having a grade of 85.64 percent. The tentative oathtaking date for the passers of October 2013 bar exam is on Monday, April 28, 2014 at the Philippine International Convention Center (PICC), Pasay City.